Description: Among the geographic manuscripts in the Bavarian State Library is a series of the most important portolan charts that have come down to the present. 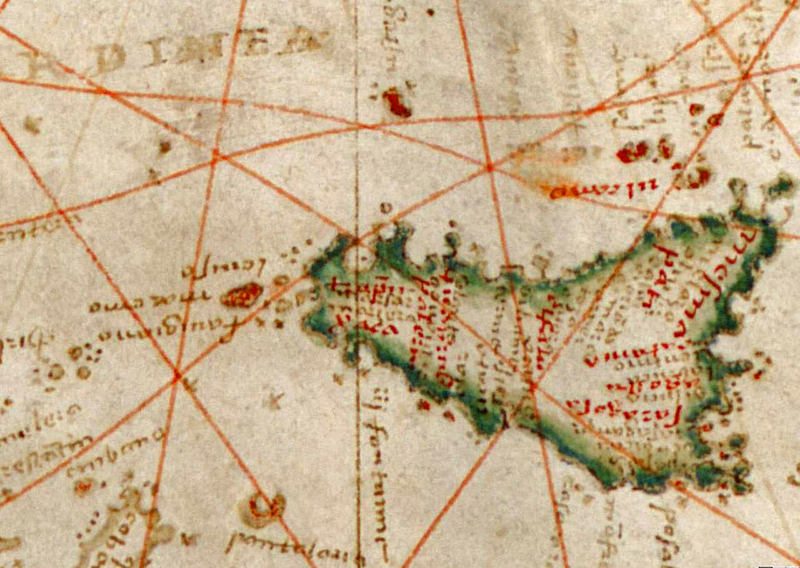 These charts consist of a single piece of sheepskin with part of the sheep’s neck, showing the outlines of the continents and the names of coastal settlements. The maps include several rose compasses and show landmarks, the distances between which could be determined using a pair of dividers. The maps were an important navigational aid to mariners. The holes in the parchment reveal the points where the chart was fastened to a mast or desk. This precious portolan chart of the Old World from around 1505 was made in Italy, which produced, in Genoa and Venice, two important schools of 16th-century geographers. The map was transferred to the Bavarian State Library from the Cistercian monastery of Aldersbach. It is extraordinary for the precise and detailed knowledge of the mountain chain from Spain to the Urals that it reflects, and for its portrayal of the regions of Africa and Asia, whose exotic masters are depicted along with their surnames. The texts accompanying the chart begin with capital letters and underline the importance of the pilgrimage cities of Jerusalem and Mecca.